I’ve always been a big supporter of OzHarvest, Australia’s leading food rescue charity. Every day passionate volunteers collect food that would otherwise go to waste and quickly re-distribute it as meals to homeless people and others in need. Since 2004 OzHarvest has nourished 1000s of Australians with over 38 million meals. 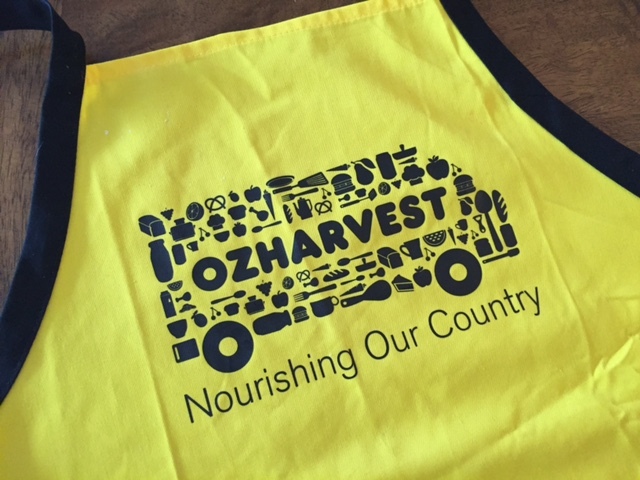 Through my personal experiences working with OzHarvest I’ve come to really appreciate their role in reducing food wastage and feeding those that would otherwise go hungry. So, when tasked with organising a recent fun team bonding event the OzHarvest “Cooking for a Cause” program was an obvious choice. 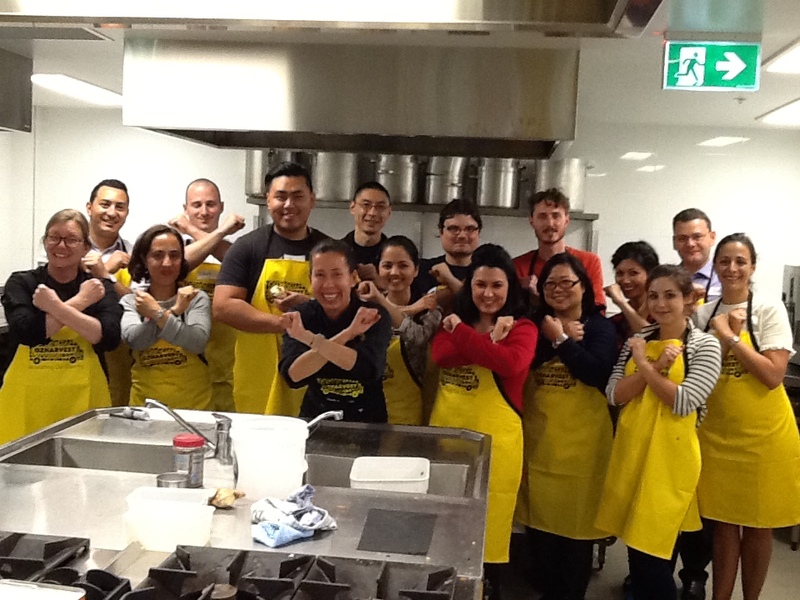 Under the banner of “Cooking for a Cause” myself and 15 team members found ourselves in the OzHarvest kitchen transforming a mountain of donated produce into over 300 meals. 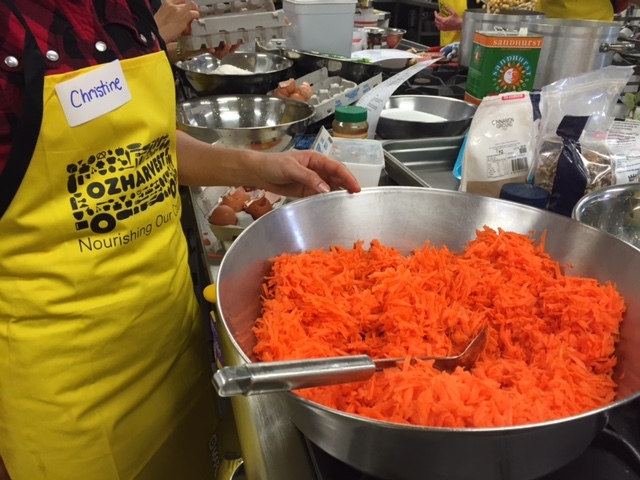 With the help and guidance of three friendly professional chefs we made giant portions of pumpkin salad, chicken tagine, carrot cake and more. When the chefs mentioned that carrot cake was on the menu I got excited – a chance to grow my novice baking skills with professional tips. But I soon discovered that grating 3 kg of carrots and whisking 27 eggs is hard work….. Anyway over 300 meals later the OzHarvest carrot cake challenge inspired me to make a gluten free and no added sugar version at home. 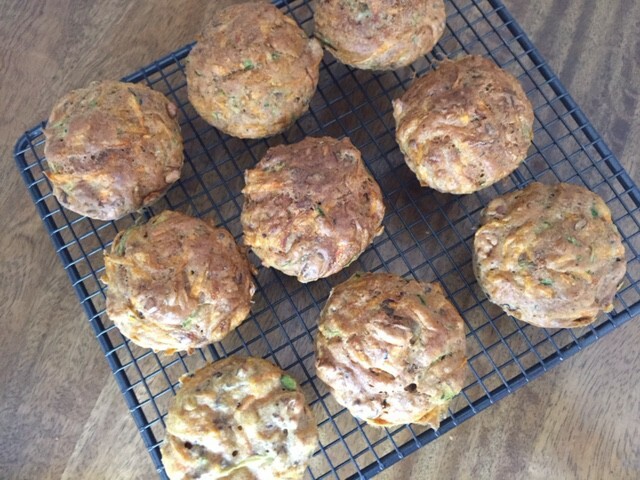 Here I’m sharing the original OzHarvest recipe alongside my more saintly alternative. Peel and grate the carrots and chop the walnuts into pieces. Whisk the eggs, sugar, oil and vanilla until well mixed, then add the carrots and walnuts. Add the bicarbonate soda and spices to the sifted flour. Add the wet mixture into the dry mixture and gently combine the two together. 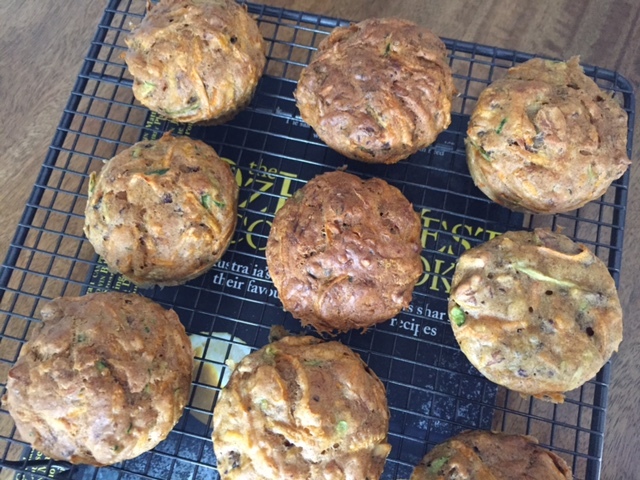 Pour into a cake tin or individual muffins tins. 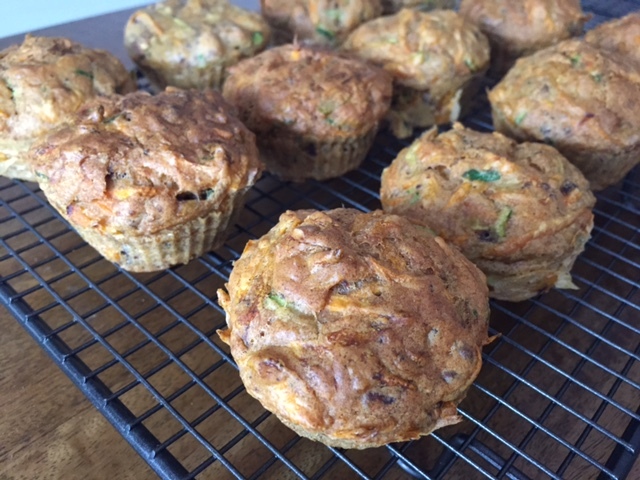 Bake in the oven at 180C for 30 minutes (muffins) to 40 minutes (carrot cake). You can also top your cake or muffins with lemon icing – beat 250g cream cheese with 125g of softened butter in a food processor or mixer until soft and well blended. Mix in 1 tbsp lemon juice, the grated rind of 2 lemons and 4 cups of icing sugar. Gradually combine until icing is smooth and creamy. 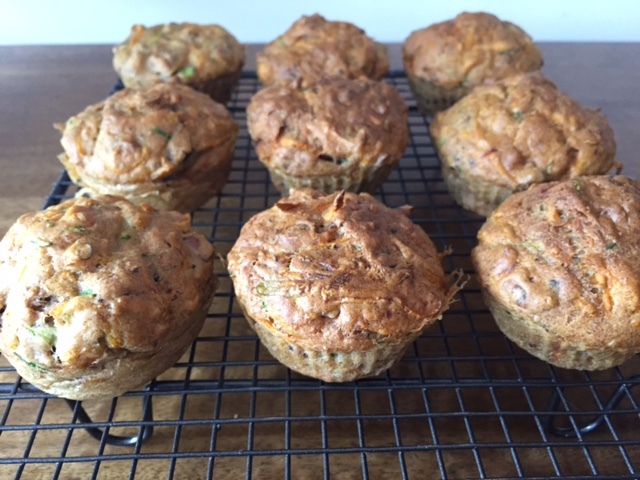 Spread onto cooled cake or muffins. As a nation Australia wastes four million tonnes of food each year (it ends up in landfill), yet two million people per year still rely on food relief and food relief agencies can’t meet demand. Founded in November 2004, OzHarvest is a food rescue organisation that collects quality excess food from commercial outlets and delivers it to 600 charities – providing much needed assistance to vulnerable men, women and children across the country. 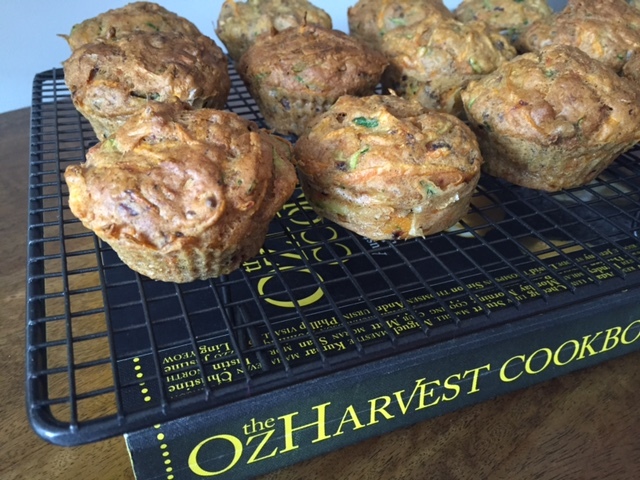 Tags: cake, carrot, gluten free, muffins, OzHarvest, recipe. Bookmark the permalink. Thanks Chitra, I think they would have been even better had I added the lemon icing! Thanks Hungry Mum – and glad you’re across OzHarvest too – the more supporters the better! Thanks Elaine – I don’t recall an equivalent for OzHarvest in the UK but I am sure there must be a organisation like it…..?